There’s a good reason why some recipes for glittery body gel are called “Fairy Dust Gel” or “Fairy Glitter” – these easy concoctions are magically simple to make, while providing a mysterious dusting of glimmer and shine. That light shimmer on cheekbones, shoulders or arms is very appealing, especially for girls of a certain tween age, women who love to brighten the night – or people like me who simply love fairy tales. In a small bowl, mix a quarter of a cup of clear aloe vera gel with one teaspoon of liquid glycerin. Stir in a quarter teaspoon of ultra fine glitter and blend well. To tint the body gel, stir in one or two drops of food coloring. You can now use the body gel as is, unscented, or add a drop or two of essential oil, fragrance oil, or your own perfume to add scent. Store the gel in small, air-tight containers. – Ordinary craft glitter is often made of flaked metal and isn’t suitable for cosmetic use. 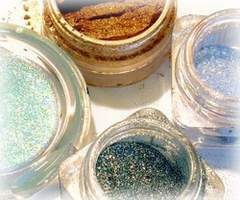 – Cosmetic grade glitter is fine for use on skin and hair, but shouldn’t be used close to the eyes. – As with any cosmetics, there is always the risk of allergic reaction, and only you can decide if the ingredients in these recipes are suitable for you. Add one cup water and two tablespoons of whole flax seeds to a small saucepan and bring to a boil. Reduce heat and simmer for five minutes, then remove from the heat and let sit for 30 minutes. Strain the mixture through a fine colander or strainer, catching the liquid in a bowl set below the strainer. Use a flexible spatula to press the flax seeds against the strainer to extract as much of the natural gel as you can. If any smaller seeds have fallen through the strainer, use a spoon to remove them from the liquid gel now. If desired, stir in a drop or two of fragrance oil. Stir about a teaspoon of glitter into the flax seed gel. Experiment with colors; silver and gold enhance most hair colors, while coppery hues add lustre to red or brown hair. Use white glitter gel for sparkling highlights in blonde hair. Keep the glitter hair gel in a glass jar with a tightly-fitting lid. Store at room temperature.